Felting 3 Ways: Fun, fast & festive projects! The countdown continues! Last month we shared six simple tips to make your handmade holiday gifting easier; click here to read if you missed that post. On today's post, we'd like to explore 3 felting techniques which you can use to create beautiful gifts in a jiffy! Feel like felting? Here are some quick and easy project ideas to try out! 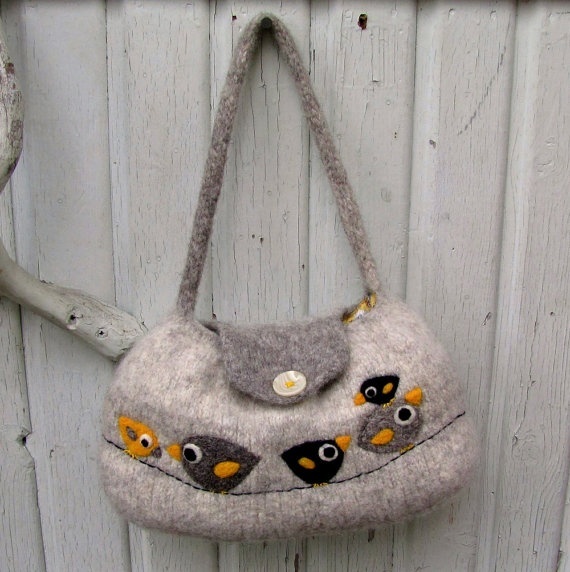 Add embellishments to any woolen item with needle felting. This is a great way to personalize a project and be creative! Flowers, birds, initials and other motifs are easy to add with needle felting - simply lay your wool on the surface to create the desired pattern, then pierce with your felting needle until it has fused with the woolen surface. How cute is this this little tote? 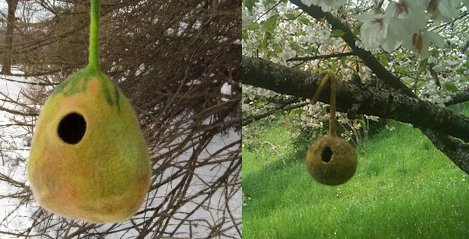 Wet felted bird houses, two ways: They are are fun to make, just use some wool fiber with a waterproof form such as a balloon to shape your bird house. If you don't have any fiber on hand, you can use some wool yarn to knit a bird house to wet felt using this free Ravelry pattern. We'd be remiss if we didn't mention felted ornaments on this list! You can use a small amount of wool fiber to easily create round ornaments using wet felting techniques. For bonus points, you can embellish your ornaments with - you guessed it - needle felting! Needle felting is another technique which comes in handy when making decorations for your holiday tree, and we've got plenty of suggestions for you on our Needle Felting pin board. For your discerning fiber friends, a nuno felted scarf or wrap is sure to be a well-loved gift. Nuno felting is a fascinating process which fuses fibers and lightweight fabrics such as silk or nylon together using wet felting techniques. If you are new to nuno, we have found a step-by-step tutorial on this blog to help get you started! May your holidays be crafty, festive, and most of all….stress free!